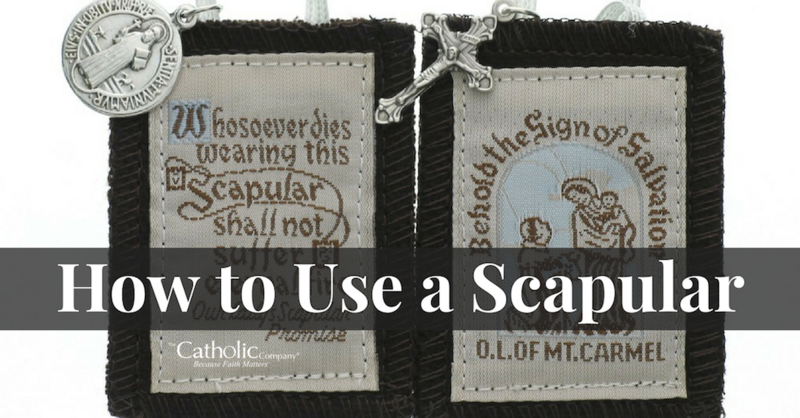 Most often when we hear the word scapular, we think of a scapular in its most recognizable form, a small necklace of sorts constructed from two wool patches of cloth. Scapulars, however, originated from the habit of monastic orders and started off as a work apron. From this “apron” developed a special monastic garment to be worn by specific religious orders. The scapular, in its original form, was often referred to as jugum Christi, or the yoke of Christ, and was even worn at bedtime. A scapular worn in this way is a large piece of cloth that covers the individual from shoulder to shoulder and hangs down as far as the ankles, with an opening in the center for the head. During the early Middle Ages, the laity began to associate themselves with various monastic orders and formed Confraternities, secular oblates that would receive the scapular to wear upon death, as a sign of great honor. Eventually, this tradition transformed into the small sacramental scapulars of today that are worn daily under or over regular clothing as an open sign of devotion. The four oldest scapulars originated from four confraternities, the Carmelites, Servites, Trinitarians, and the Mercederians. Today there are many more kinds of scapulars, and not all of them associated with a particular confraternity. The original and most common scapular is the Brown Scapular of Our Lady of Mt. Carmel. Given by Our Lady herself to the Carmelite friar, St. Simon Stock, with special promises to its wearers, the brown scapular is a sign of devotion and personal consecration to the Blessed Virgin Mary, placing oneself under her mantle of protection. A small scapular must consist of two wool squares of cloth, connected by two strings (of any material), so that one segment rests on your chest and the other on your back. If you would like, you can wear more than one scapular at a time, so long as each scapular is complete. Once you have your scapular it is important to have it blessed by a priest and, if necessary, to become invested in the confraternity associated with it (a further blessing that can be granted by an authorized priest). Learn more, and find the Brown Scapular investment prayer here: Our Lady of Mt. 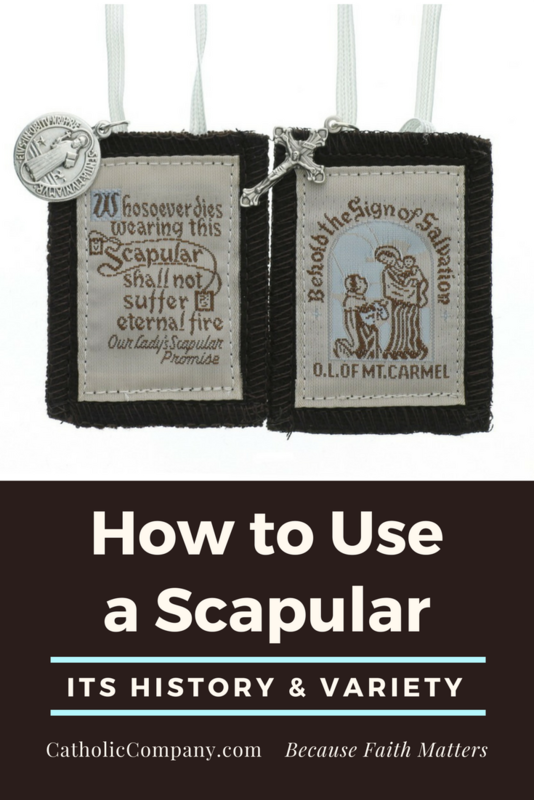 Carmel’s Brown Scapular: What You Need to Know. Once you have your scapular blessed, it must be worn at all times in order to share in the indulgences and privileges of the particular scapular. Should you remove the scapular for any period of time you are no longer eligible for its associated blessings, however, as soon as you resume wearing the scapular you are reinvested in its indulgences. Should your scapular wear out, you may replace it with a new scapular, as the indulgences are invested in the devotion of the wearer, not the object. Although the initial scapular investment prayer is recited only once and is bound to the wearer, each new scapular that replaces a worn or lost one can be blessed by a priest. Shop these more varieties of scapulars here. The brown scapular is most likely the oldest of all the scapulars and has served as a model for all others. It was on July 15, 1251 that the Blessed Virgin Mary appeared to St. Simon Stock in Cambridge, England, in response to his prayers for his oppressed order, the Carmelites. The Blessed Mother appeared to him with a scapular in her hand and said, “Take, beloved son this scapular of thy order as a badge of my confraternity and for thee and all Carmelites a special sign of grace; whoever dies in this garment, will not suffer everlasting fire. It is the sign of salvation, a safeguard in dangers, a pledge of peace and of the covenant.” Mary also promised to grant special aid, especially at the hour of death, to all those who wore the scapular with fidelity and honor throughout life. Also associated with the brown scapular is the Sabbatine privilege. This states that Mary will intercede and pray for those in Purgatory who in earthly life wear the brown scapular in good faith, are chaste according to their position in life, depart earthly life in charity and daily recite the Divine Office or the Little Office (with permission of your confessor, as it is a shorter version of the Divine Office) or pray the rosary. The general appearance of the scapular of Our Lady of Mt. Carmel consists of two brown pieces of wool, black is also acceptable, along with the image of Our Lady of Mount Carmel. Those who wish to become invested in the Confraternity of Mount Carmel need only have their scapular blessed by a priest. The green scapular, or the scapular of Conversion, was created in 1840 when Mary appeared to Sister Justine Bisqueyburu of the Daughters of Charity in Paris. The green scapular has become known as the scapular of conversion and carries promises of strengthening faith, protection against Satan, a happy death for Catholics and especially for the conversion of those outside of the church. The green scapular can be worn or carried by the faithful or given to an unbeliever in hopes of their conversion. Those who wear the scapular of Conversion are to say the following prayer daily, “Immaculate Heart of Mary, pray for us now and at the hour of our death.” If you decide to give the green scapular to an unbeliever you may pray the prayer on their behalf and hide the scapular somewhere near them if they do not wish to accept it. There is no need to enroll in any confraternity to wear the green scapular, however it should be blessed by a priest. In her autobiography, the Venerable Ursula Benicasa, foundress of the Order of Theatine Nuns, describes how the blue scapular was revealed to her, by Christ, in a vision as a means to honor the Immaculate Conception. She asked the Lord to extend the great favors he promised to her Order to the faithful who wear the blue scapular to secure the conversion of sinners. The scapular of the Immaculate Conception must be made of blue woolen cloth and usually bears a symbol of the Immaculate Conception on one piece and the name of Mary on the other. According to the General of the Theatines a priest may admit the faithful to the confraternity and bless the scapular, but must also forward the names of those admitted to Rome or another canonically approved confraternity of the same kind. The red scapular of the Passion owes its origins to an apparition in 1846 to a Sister of Charity of St. Vincent de Paul. Jesus revealed to her a scapular and promised to all who wear it that on every Friday he would grant a great increase of faith, hope and charity. The red scapular of the Passion must be made of red woolen cloth and bands. On one segment of wool is Jesus on the Cross, below which are the implements of the Passion and the words, “Holy Passion of Our Lord Jesus Christ Save us.” The second piece of cloth bears the image of the Hearts of Jesus and Mary, above which is written, “Sacred Hearts of Jesus and Mary, protect us.” The Superior General of the Lazarists has permitted other priests to bless and invest the faithful with the red scapular. The scapular of the Most Sacred Heart of Jesus originated from a version created by Blessed Margaret Mary Alacoque, who made and distributed the scapulars herself. The scapular of the Most Sacred Heart of Jesus was widely used during the plague at Marseilles as a form of protection, and also during the horrors of the French Revolution as a safeguard for the faithful. This first version of the scapular however, was called a scapular but did not carry any of the conditions of a scapular. It was not until 1900 that the official scapular of the Most Sacred Heart of Jesus came to be and was designed from two segments of white woolen cloth connected by two strings. The first segment displayed the image of the Sacred Heart, while the other of the Blessed Virgin under the title, Mother of Mercy. The scapular of the Most Sacred Heart of Jesus should be blessed by a priest in order for the wearer to become fully invested. The scapular of Our Lady of Ransom is made of white wool and bears the image of Our Lady of Ransom on the front segment of the scapular, the back segment being plain white. The scapular of Our Lady of Ransom was founded by the Fathers of the Order of Our lady of Mercy for the Ransom of Prisoners in 1256. Those invested in this confraternity may gain its indulgences by having the scapular blessed by an approved priest according to the General of the Mercedarians. The scapular of St. Michael the Archangel was established in 1878, when the Church of St. Eustachius in Rome founded a confraternity in his honor. The scapular of St. Michael the Archangel is unique in form, as it is shaped like a shield, one black and one blue. Like the segments of wool, one band or string tying the two pieces together is black and the other is blue. On each shield is the image of St. Michael slaying the dragon along with the words, “Quis ut Deus.” According to the Congregation of Rites the scapular of St. Michael the Archangel may be blessed by any priest. The scapular of St. Joseph belongs to the Capuchin Order and was approved by the Diocese of Verona by Decree of the Congregation of Rites in 1880. The scapular of St. Joseph serves as a reminder of the virtues of St. Joseph (humility, modesty, and purity), as well as to pray to St. Joseph, ask him for his prayers for the Church and to assist the dying. The scapular of St. Joseph is created from two violet colored wool pieces, on which are sewn two pieces of gold fabric of the same size, connected with white strings. On the front segment of gold cloth is the image of St. Joseph holding the child Jesus in his right arm with a stem of lilies in his left. Below this image is the inscription, “St. Joseph, patron of the Church, pray for us.” The other gold piece of fabric is decorated with the papal crown, above the crown is the dove, to represent the Holy Spirit, and below a cross with the keys of Peter and the inscription, “The Spirit of the Lord is his Guide.” As with all other scapulars it is recommended to have the scapular of St. Joseph blessed by a priest. The Five-Fold scapular consists of the five most popular scapulars, The Red Scapular of the Passion, The Scapular of the Most Blessed Trinity, The Brown Scapular of Our Lady of Mount Carmel, the Black Scapular of the Seven Dolors of Mary, and the Blue Scapular of the Immaculate Conception. When all five scapulars are joined together they must all be strung on bands of red wool, as is mandatory for the Red Scapular of the Passion. When wearing your Five-Fold scapular the Red Scapular of the Passion should be foremost so that the image of Jesus on the Cross is visible. The fifth scapular should be that of the Most Blessed Trinity with the image of the red and blue cross exposed. Any priest may bless and invest you with the Five-Fold scapular. A person who is invested in the Brown Scapular may replace it with a scapular medal. According to the Holy Office, as of December 16, 1910, a scapular medal is an acceptable substitution for the traditional wool cloth scapular, and it can replace multiple scapulars if it is blessed with each individual blessing of the various scapulars for which it is being substituted. A scapular medal must consist of the image of the Sacred Heart of Jesus on one side and a representation of the Blessed Virgin Mary (usually Our Lady of Mt. Carmel) on the other. As with all scapulars, a scapular medal must be worn at all times in order to receive the indulgences associated with it. Catholic Encyclopedia. “Scapular” [Online] 11 June 2008. . Fish Eaters. “Scapulars” [Online] 11 june 2008.